As a teacher myself, I understand how crucial it is to be organized and on-task throughout the week, especially when you take into consideration how much there is to manage outside of the classroom too. I could have made a million printables to go with this set, but I'm trying to follow some of the advice I was given from some of my other teacher friends, which is that "less is more." If your school is like mine, we are working hard towards a "Go Green" initiative, which means that a lot of the paperwork we used to have to fill out is now being submitted and shared electronically. BUT WHAT ABOUT THE PLANNER-LOVING TEACHERS OUT THERE?!! No matter how "Green" I have become as a teacher, I refuse to let go of my paper. It's how I plan best. 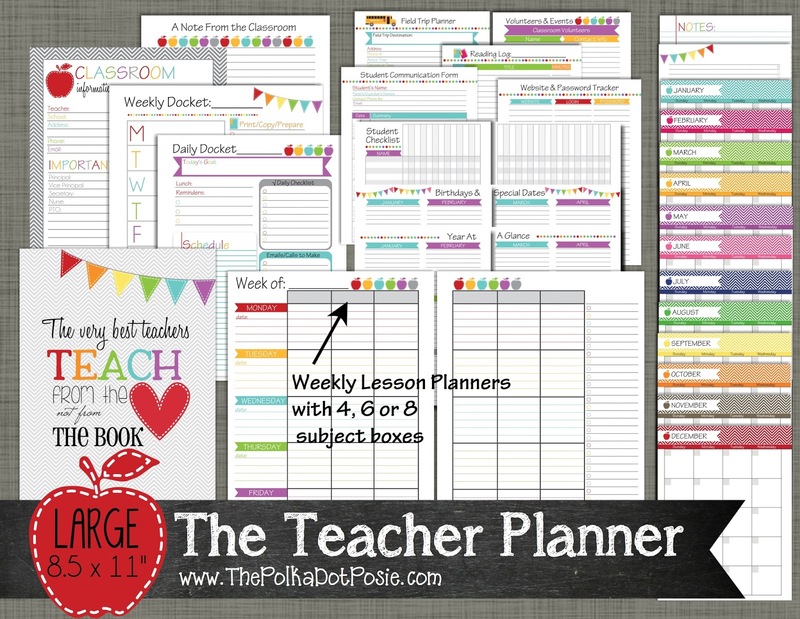 The Teacher Planner was designed with planner-loving teachers like me in mind. It has a TON of wonderful options and includes printables that teachers of all grade levels can use. It also comes in two sizes, LARGE (8.5 x 11") for people who need a lot of room to write, and SMALL (5.5 x 8.5) for people who like their planner to be a little more portable. 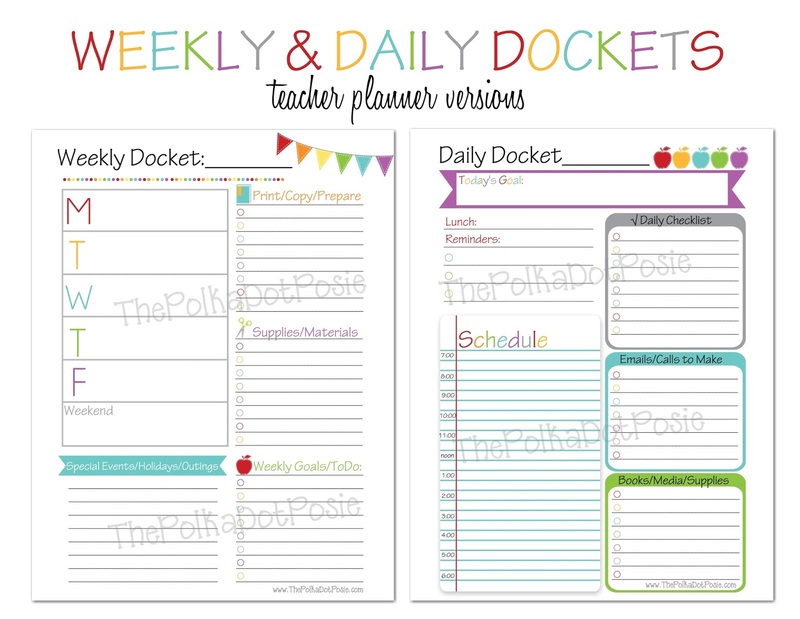 As of right now, The Teacher Planner is sold as a set, but we will be listing some of the individual dockets and pages separately in the near future. Now, for all of you HOMESCHOOL teachers out there, we haven't forgotten about you either. 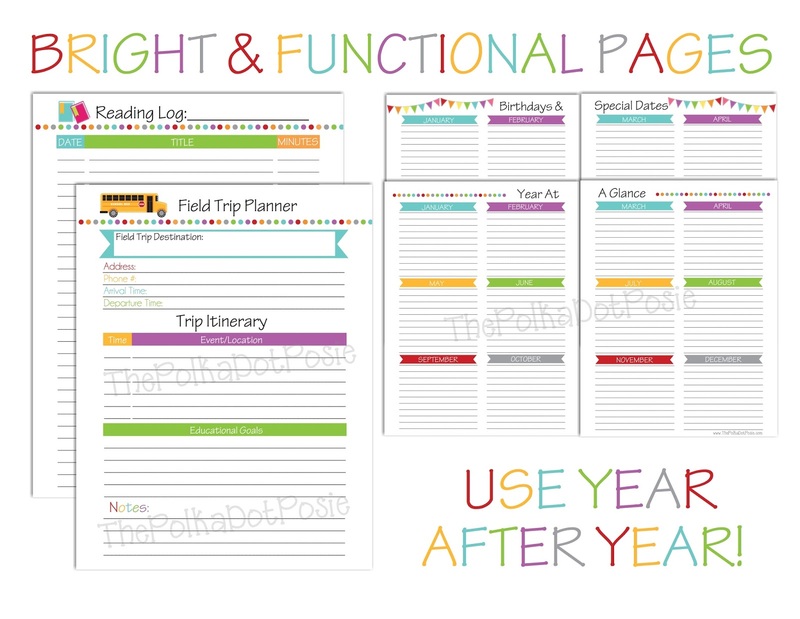 We've adapted our Teacher Planner to meet the needs of a Homeschool classroom with many of the same printables customized to your needs. 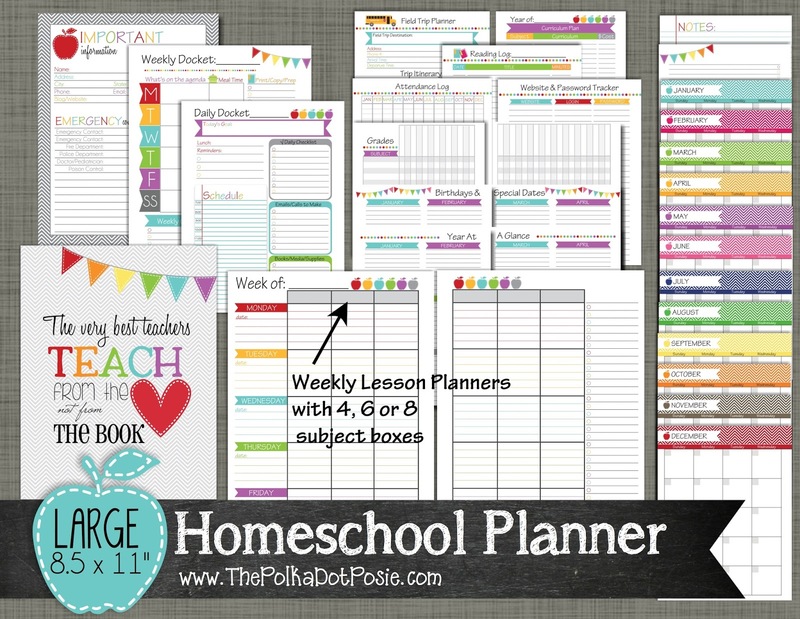 We offer the Homeschool Planner in LARGE and SMALL as well. There are so many things I love about our Teacher and Homeschool Planner. For starters, I love having options and the flexibility of individual pages means I can build the perfect planner for ME. I can choose how to set them up and because the calendar and lesson planners are undated, I can use them year after year. Also…I love that I can build my planner in my beloved Martha Stewart Discbound (or any other planner or binder that suits your needs). As you can see in the picture, I decided to create some word art to go with our teacher and homeschool planners. It was going to be an extra page to use somewhere in your planner, home or classroom, but I liked it so much, I decided to use it as my cover page this year!!! There are two different word art printables to choose from, or you can go with one of our two standard covers. Perhaps the most important part of this planner is the Weekly Lesson. Every teacher has their own system, but I decide to go with one of the most requested layouts I have had from teachers, and I included 3 different options so that you can pick between 4, 6 or 8 subject boxes. Even though having a variety of monthly, weekly & daily pages is great for organization, sometimes you just want a good old Notes Page or ToDo list. Well…we have you covered :) Check out all the AWESOME pages this planner offers. As much as I LOVE color in my planner pages, the cost of ink is outrageous these days. But for me, a black and white planner just doesn't make me smile. So, I tried my hardest to make this set as bright and functional as I could, without breaking the bank. And because you can use this set year after year, it's a wise investment :) I hope you love them as much as we do!! We will be giving away planners to FIVE LUCKY TEACHERS!! You will get to pick which planner and which size you want!! But hurry…this giveaway ends Thursday!! All winners will be chosen and notified this Friday. GOOD LUCK & HAVE A GREAT SCHOOL YEAR!! I'm an unorganized homeschool mom in desperate need of a good planner!!!! Thank you so much for this opportunity!! The colors are so inspiring! 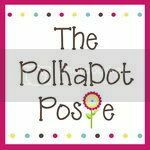 This homeschool mama of three could use some cute organization this year! I was just looking at planners last night! This might just be my saving grace for a first time homeschooler! I love homeschooling for many reasons. The best is spending time with kids while they learn. I would love to win one of these colorful planners. 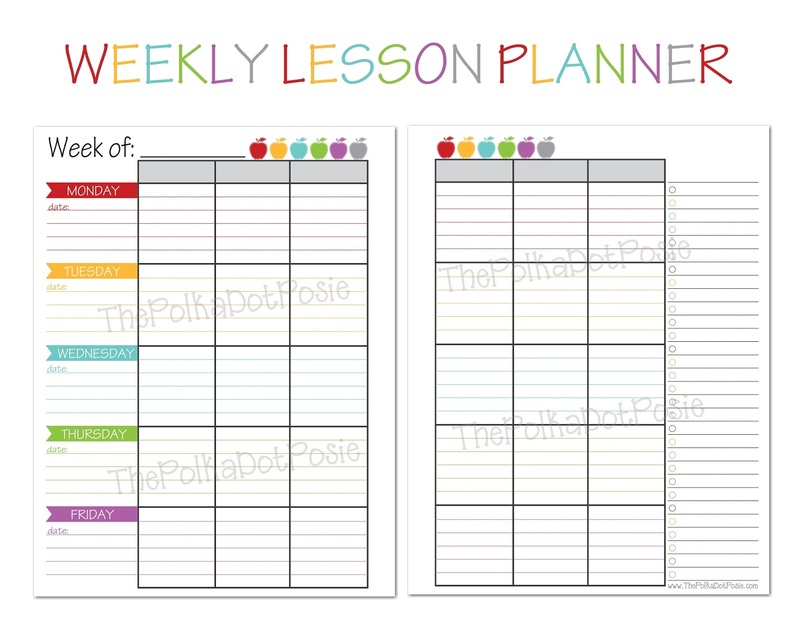 The teacher planner looks great - very versatile for a lot of different needs. Thanks for the opportunity to win one! I teach preschool and love seeing the excitement on a child's face when they can finally do something they have been working on for awhile. I happened across your blog yesterday and seen this planner would be available today and I'd use this for various reasons. Love it!! 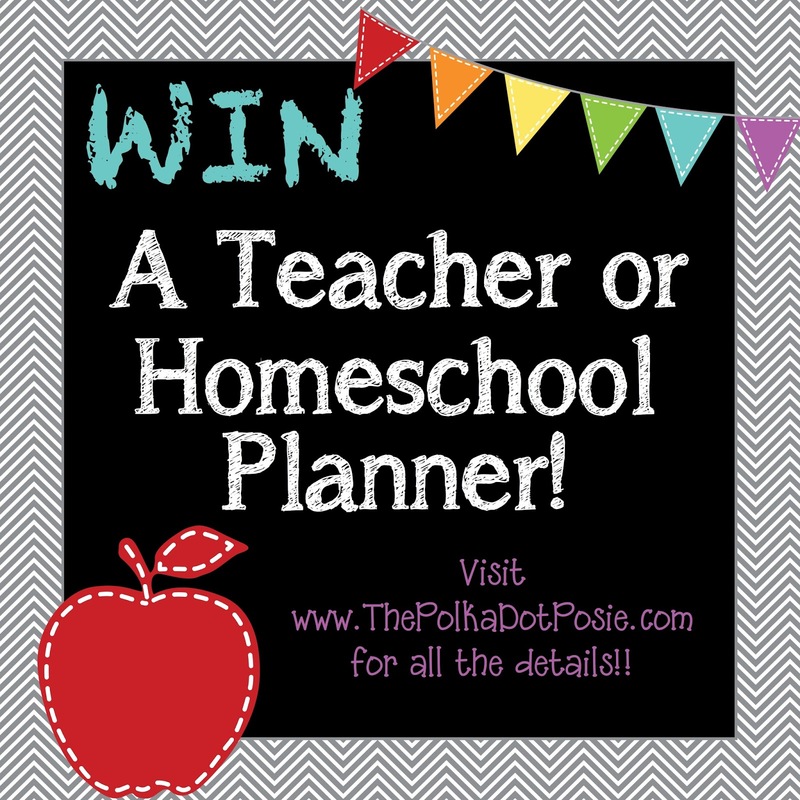 I would love to win this, it would be prefect to help me stay organized this year on my first year homeschooling our kindergartener and preschooler! I need all the help I can get to make the most of this fun journey we will be on!!! LOVE this! It is bright, colorful and I cannot wait to get organized! Thank you for providing it. 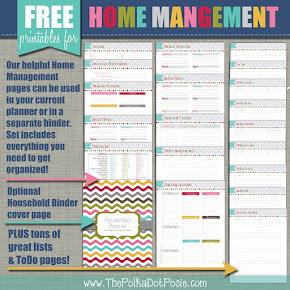 I love the colorful designs on your organizational tools and notepaper! They would be perfect in my fourth grade classroom! 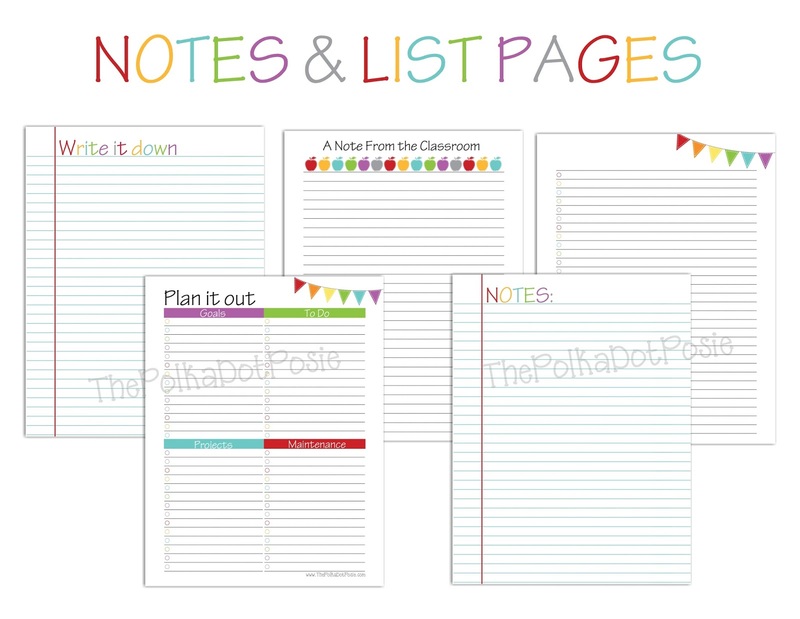 I just got your small planner to keep myself and home more organized and I would love to be able to keep my classroom more organized, too. This looks great...love the colors. I love being at school with my kids! It is a great profession for a mom! This will be my first year homeschooling and this planner is PERFECT for keeping me organized! I'm homeschooling a high schooler for the first time this year and also homeschooling at the elementary level, so I need to be extra organized this upcoming year. These pages would be perfect! This could really help me as a mom to keep 2 kids on their educational track. I love being able to watch my kids grow and prosper academically. I love witnessing the "AHA" moment! Makes all the countless hours of planning worth it! Love the large planner. Full of great pages! I love your designs! I think I'd choose the large. I love this! 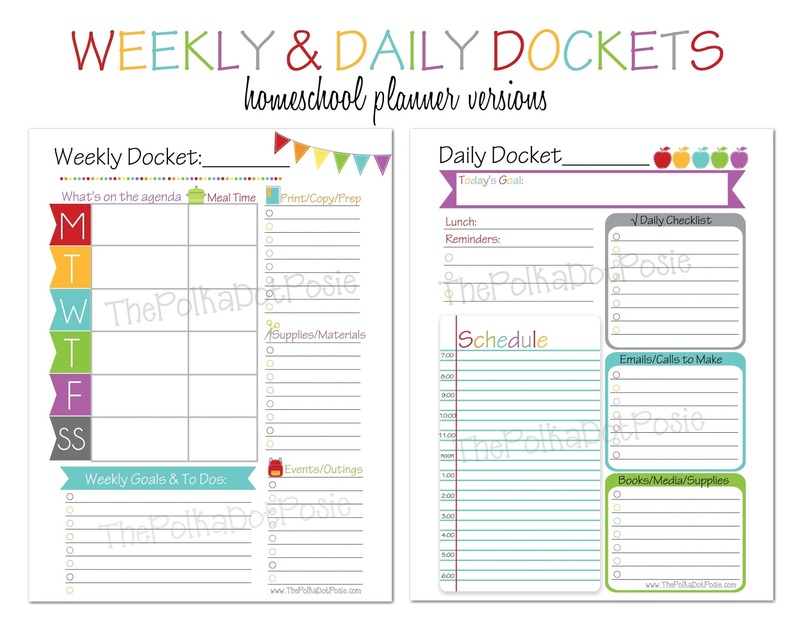 Looks like a great planner for our homeschool year! Setting foundation for a love of learning. Love it Jen! So adorable! I really love it! It's colorful and organized...would love to win this! I desperately want to purchase your Direct Sales planner but I just went to your Etsy shop and it's closed! Is there any way I can still purchase it? I bought a notebook and all of the other goodies to set it up this morning and then when I got home you were closed! :( Please let me know if there is any alternative way to purchase. It is just too cute and I haven't been able to find anything even close to it! Hip hop and rap have relied heavily on the practice replica louis vuitton of sampling ever since, dior replica but you'll occasionally find omega replica examples of sampling in other genres gucci outlet. But legal issues have largely stifled its widespread use.